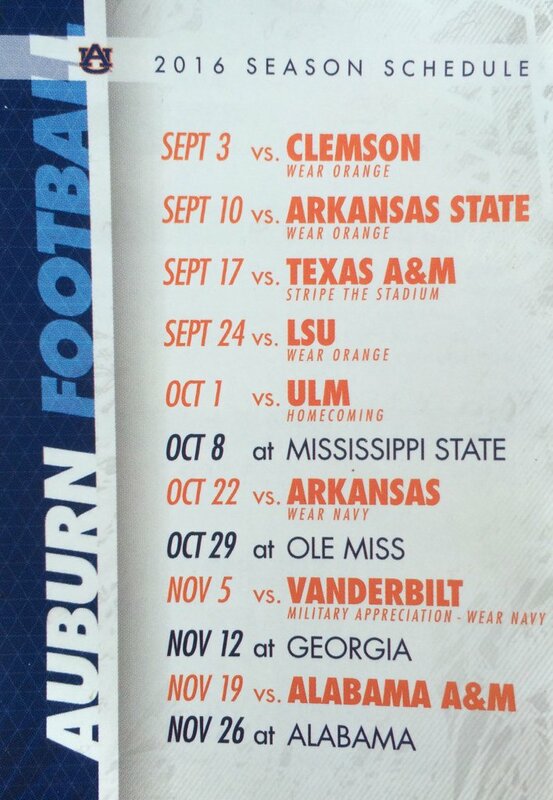 You may have noticed that what I call “pocket schedules” have been popping up around Auburn the last week or so. They are the true sign that football is getting real. It’s close. Well, I picked one up at the Great Clips over the weekend and noticed that a few things have changed with Auburn’s clothing schedule. You see, for people that look for dumb less important things to blogle about, these schedules have been good for content. They usually tell us when the “All Auburn, All Orange” and “True Blue” games will be happening. This year, that has changed. As you see, now they’re just telling us what to wear and not giving it a fancy name, which I’m fine with, but even then there are a few more changes. Now there are two “blue” games, one being the now customary “Military Appreciation” game. To be honest, I like wearing blue a little more often. Since Tuberville, I’ve always gone with wearing orange unless they told us any different. So now they are doing that. Texas A&M gets the Stripe the Stadium game, which did work well last year, so I hope Auburn isn’t 0-2 at that point and people still feel like doing it. UL-Monroe and Alabama A&M get the “wear whatever” games because, and let’s be honest, that’s what they deserve. Back at the top, I’ve seen a few people complain that Auburn asked fans to wear orange for the Clemson game. “We’ll look like Clemson fans! That’s what their fans will be wearing!” Yeah, they might, but guess what, they’ll blend right in and complete the stadium as a sea of orange. And let’s be clear, Auburn is never doing anything like Clemson. Clemson copies or has copied every thing they’ve ever done from Auburn. And don’t you forget it. Now you know what to wear. Plan your outfits accordingly. And quit complaining that you don’t look good in orange. We’ve been doing this for over a decade now. When do we find out which sections wear which color for the A&M game? If you wear Orange to the Clemson game, you are a fool. This might be the dumbest idea I have ever heard of in Auburn football history. Maybe if the team comes out in orange jerseys, we can make them feel like this is a practice for them. Someone in marketing should be fired, and you should be fired for trying to promote this. I’m sorry, I forgot that point in time where we all decided that we were going to let Clemson dictate what we do. Last I checked, they have copied nearly everything Auburn has ever done, including the idea to play football. Auburn fans have primarily worn orange to games for over a decade. Not to mention, when those few thousands Clemson fans show up wearing orange, the entire stadium will then be orange. Just like it has been since Tuberville.